Awwwwwwwwww... she is SUCH a doll! It's soooo wonderful to have a happy adorable baby around. Too bad that same baby (at least if he's mine) can do a 180 and be angry-fit-throwing baby five minutes later!! 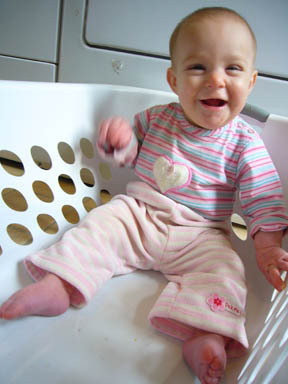 Awww, she makes me almost want to do laundry...ALMOST.